There were a bunch of different sous vide cookers on sale during Amazon’s big Prime Day blitz, but the Anova Culinary 800 Watt Sous Vide Precision Cooker with Bluetooth was by far the best-selling model we covered. Like every other sous vide cooker, this device works by submerging your food in a water bath after it’s wrapped in an air-tight bag. Then it heats the water to the target temperature and slow-cooks it for hours. The flavor gets trapped in your food since it has nowhere to go, and the result is the most delicious tasting food you’ve ever had. 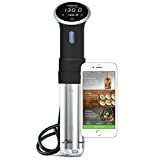 This Anova model also has Bluetooth so it can connect to your iPhone or Android, and it’s still currently on sale at a hefty $60 discount! COOK LIKE A PRO – The Anova Precision Cooker allows anyone to cook a restaurant quality meal at home. Our Sous Vide circulator is the perfect kitchen appliance for hands-off cooking of vegetables, meat and much more with consistent control and precision. We’re so confident in our product Anova backs it with a 1-Year Warranty. SMART DEVICE CONTROL & COOKING NOTIFICATIONS – Our temperature cooker is can be controlled remotely with smart devices, allowing you to escape from the kitchen while you cook. Simply download the Anova App to easily monitor, adjust or control the device from your iPhone and Android or other smart devices. The precision cooker also provides you cooking notifications while you’re out of the kitchen so you’ll know when your food is ready. The Precision Cooker’s blue tooth connection allows you to control the device up to 30 feet away. GET CREATIVE WITH 1,000+ RECIPES – Choose from sous vide guides and recipes created for home cooks of every skill level by award-winning chefs, with simple directions to walk through each recipe with ease. All available free of charge. Great for beginner and veteran chefs!